The single most important performance characteristic required when considering lasers for holographic applications is long coherence length, in addition to good power stability, wavelength accuracy and stability, and, above all, excellent reliability. The Nobel Prize was awarded to Dennis Gabor in 1971 for his ‘invention and development of the holographic method´. He was awarded the prize for work done in the 1940´s, long before the laser was invented. 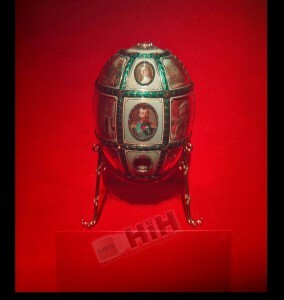 Since the laser´s invention in 1960, holography as a recording method and as a technique to display 3D images as an art form, took off. Later, holographic techniques have also been applied to fraud protection. In the past half-decade increased availability of more compact and lower cost single longitudinal mode (SLM) lasers, along with the development of a new generation of sensitive emulsions and the availability of wavelength selectable LED based illumination sources have opened up new application areas for holographic techniques. For instance, these technology improvements have paved the way for bringing head-up displays and associated technologies for virtual reality (VR) and augmented reality (AR) projection into the high-volume consumer markets. Although high volume replication of holograms and HOEs has already been used in the security industry in the form of embossing for decades, the requirements for head-up displays mean that holograms with better resolution than what embossing can offer are needed. This in turn means that lasers will likely be used to write these types of holograms, and most likely this will be done in a form of a laser printer, akin to the current 3D printer. Developments in laser technology, emulsions and illumination sources have also lead to drastic improvements in the white light holography, which is opening up new applications for holography related to ultra-realistic 3D replication of objects. The performance characteristics of the lasers used to write single or multi-color holograms or HOEs, whether as a master or in volume production, are critical. Analogue holography is based on creating a 3D image representation of an object onto a 2D holographic plate by recording the interference pattern that occurs when exposing an object with coherent light and mixing the light reflected from the object with a reference beam from the same coherent light source. The hologram is a 3D representation of the object as the interference pattern includes phase information of the reflected light. In single color holography, a single laser is used to record the hologram, either by exposing the object in real life or from a 3D CAD file. Ideally that single color light source is then used to illuminate the hologram to render a 3D image of the object with the highest clarity. In reality, holograms tend to be illuminated by incandescent sources, which typically results in an image rendering that is not sharp and in a single color only. In contrast, in white light holography typically 3 colors (and up to 5) are used to write the hologram; blue, green and red. 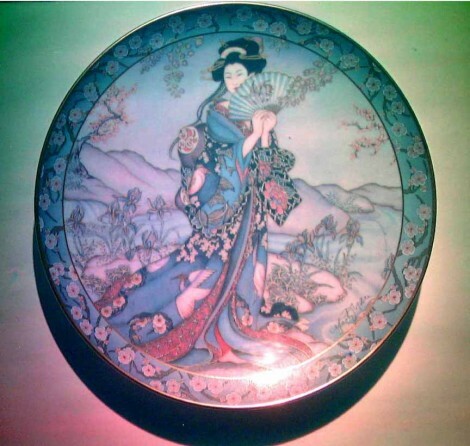 In combination with the new sensitive emulsions and the fact that wavelength tailored LEDs can be used to illuminate the hologram at wavelengths very close to the writing wavelength to achieve utmost clarity white light holography has lately received intense renewed interest, as it has proven capable of enabling ultra-realistic 3D replications. By far the most important performance requirement on the laser for writing a hologram or HOE is the coherence length. A hologram can more technically be described as a photograph of the light field including its phase content. In order to record the phase content of the light field, the source needs to be coherent. By coherent we mean that all the light waves travel in synchronization i.e., they have the same period and phase, and this characteristic is found in truly single longitudinal mode (SLM) or single frequency (SF) lasers. The coherence length of a light source is directly correlated to the spectral bandwidth of the emitted light (temporal coherence) and the homogeneity of the phase front over the beam cross section (spatial coherence). The distance the light needs to be coherent over in order to make an interference pattern is determined by the depth of field; the larger the depth of field the longer the coherence length that is needed. In general, a coherence length of >1m is more than sufficient. In addition to coherence length, there are a few other parameters which are important to consider. Besides wavelength, they are: output power, wavelength accuracy and stability, as well as reliability. In addition, it could be considered if the laser should be CW or pulsed. The table below summarizes how these performance characteristics impact the quality of the hologram. Important laser performance characteristics for writing holograms. This is by far the most important performance characteristic to consider when writing a hologram or HOE. A coherence length >1 m is typically sufficient for writing holograms. A laser with long (temporal) coherence length (>100´s m) has a linewidth of < 1 MHz and is referred to as single longitudinal mode (SLM) or single frequency (SF). 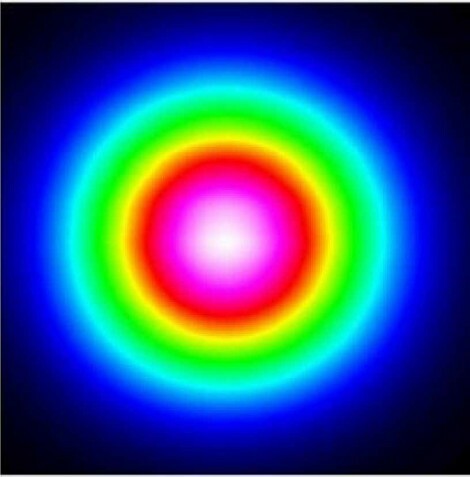 For white light hologram writing, typically 3-5 wavelengths are combined from the blue (457 nm, 473 nm, 491 nm), green (515 nm, 532 nm, 561 nm) and red (640 nm, 660 nm) parts of the visible spectrum. 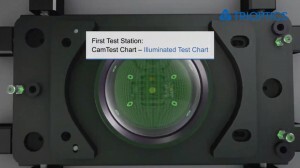 A tunable laser can be used to highlight one particular colour, or tune to the exact illumination spectrum. Typical laser output powers range from around 10´s mW in the UV, up to several watts in the red. The higher the output power the faster the hologram or HOE can be written. This is important when considering systems for volume production. Good power stability ensures that the quality of the hologram will be repeatable for the same exposure time. Ideally the laser wavelength will have very little variation from unit to unit (<±0.3 nm), ensuring holograms and HOEs will maintain their visual quality. In addition, the stability over time of this wavelength must stay very fixed during exposure and recording of the hologram in order not to deteriorate resolution. A smooth circular profile, (a TEM00 beam) means that illumination is even during exposure and that the source has good spatial coherence. In volume production, reliability becomes extremely important as all down time costs money. Select a reputable brand which has proven reliability. Depending on the time required to write the hologram. Higher output powers of CW lasers mean shorter exposure times are needed. A pulsed laser can potentially write within the pulse length but the laser needs to be SLM and have high pulse energy. Frequency converted diode-pumped single longitudinal mode (SLM) lasers are readily available in compact and affordable formats with fixed wavelengths from the UV to the near-IR and coherence lengths of 100´s meters. DPLs are solid state lasers which are more efficient, more compact and have longer lifetimes than the traditionally used gas lasers. In the visible range, a large number of fixed wavelength lines in the blue-green-red region are available (457 nm, 473 nm, 491 nm, 515 nm, 532 nm, 561 nm, 640 nm, 660 nm) with output powers on the scale of half a watt, giving flexibility to select the most optimal wavelengths depending on the emulsions and illumination source. These lasers provide inherently excellent circular TEM00 beams (Fig 1), accurate wavelengths with excellent wavelength stability (Fig 2). Figure 1: Typical TEM00 beam profile of a typical DPL SLM laser (co Cobolt AB). 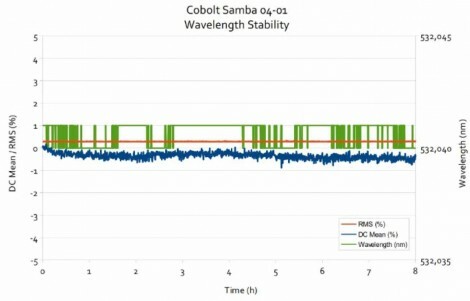 Figure 2: Typical wavelength & power stability of a DPL SLM laser (co Cobolt AB). Tunable CW single frequency, laser sources based on frequency converted OPO technology have more recently become an available option with long coherence length suitable for writing holograms and HOEs. The unique design means that any wavelength in the range 450 nm - 650 nm (however, there is degeneracy at the pump wavelength) can be accessed from a single laser unit with powers up to half watt level. The flexibility in wavelength selection that this offers can allow for complete customization of the writing wavelength, making the hologram more difficult to copy and thus extremely attractive for security-based applications. The tunability of the wavelength also allows tailoring of the exposure wavelength to the specific color of the illumination sources (e.g., LEDs), which improves the quality of the hologram or HOE. Alternatively, this wavelength flexibility can act as a complementary 4th or 5th wavelength in RGB pallet of fixed wavelengths for the creation of ultimate replication white light holograms i.e., in documentation of artefacts. This additional 4th or 5th wavelength can be used to highlight the color unique of that artifact. Single frequency or frequency stabilized laser diodes offer an alternative laser technology accessing slightly different wavelengths. In these lasers a diffraction grating element (e.g., a Volume Bragg Grating, VBG element) with a narrow-linewidth feed-back is used with a diode laser emitter to achieve narrow-linewidth emission (corresponding to long coherence length) suitable for writing holograms or HOEs. Typical wavelengths for such laser solutions are 405 nm, 633 nm and 785 nm with power levels of a couple of 100 mW. It is also possible to achieve narrow linewidth emission at higher power levels by frequency locking multi-transversal mode diode lasers. By amplifying narrow-linewidth or single-frequency diode lasers and combining them with frequency conversion it is possible to reach other wavelengths in the visible spectrum with power levels suitable for holography. An advantage of this laser technology is that is can offer some degree of wavelength tunability, typically several 10s of nm. The forth kind of laser technology is frequency converted fiber lasers. In general, high power fiber lasers are not typically SLM or SF but by amplifying single-frequency master oscillators it is possible to achieve SF performance of multi-Watt level fiber lasers. Fiber lasers and amplifiers are typically doped with Yb, which emits between 1000-1100 nm. This emission can in turn be frequency converted externally into the visible spectral range. Typical wavelengths are 488 nm, 515 nm and 532 nm with rather high output powers in the order of a couple of watts. An advantage with fiber lasers is that the frequency converted output is typically emitted from a small frequency conversion head connected to the main laser and drive electronics via an optical fiber. This small laser head has low heat dissipation and therefore does not need to be equipped with fans that may cause disturbing vibrations during the recording of the hologram. Finally a pulsed SLM laser can be considered. The first laser used to write holograms was a pulsed ruby laser. The advantage of the short pulses (ms) is that the hologram can be written in a very short time, in principle capturing the moment of moving objects. Though the pulsed ruby laser was replaced by CW lasers as the preferred source for writing holograms in the decades after the lasers invention in 1960, the advantages of being able to write a hologram within such a short period of time cannot be neglected, especially when considering volume manufacturing. The possibility of writing holograms with a single ns - 100 ns long pulse would mean that true ‘on the fly´ writing of HOEs could be possible thus realizing volume manufacturing. By definition however pulsed solid-state lasers are not typically SLM, and may be on the low side for pulse energy, making the selection of commercial pulsed lasers fairly limited. Nonetheless, in combination with sensitive emulsions films, this could be a consideration for future laser printers and true volume production of HOE´s. Figure 3: An example of a white light hologram written using RGB DPL lasers. (Co Proff. Hans Bjelkhagen). Fixed or tunable wavelength lasers, being either diode pumped lasers, frequency doubled OPOs, frequency stabilized diode lasers and frequency converted fiber lasers, either operating CW or pulsed can be used for writing holograms and holographic optical elements (HOEs). The single most important performance characteristic required is long coherence length, in addition good power stability, wavelength accuracy and stability and above all excellent reliability.